Helping to lead the semesterly Intro Geology field trip this weekend. The trip is a short, one day trip to the Akron Gorge Metropolitan Park (I’ve written a prior post related to the park). Here, the students will be exposed to geology in their own backyard – many for the first time. The Gorge Metro Park is a great locale for outcrops of the disconformity between the Pennsylvanian (~300 mya) Sharon Sandstone and the underlying Mississippian (~320 mya) Shale. An estimated 24 million years of the geologic record is missing along this contact. 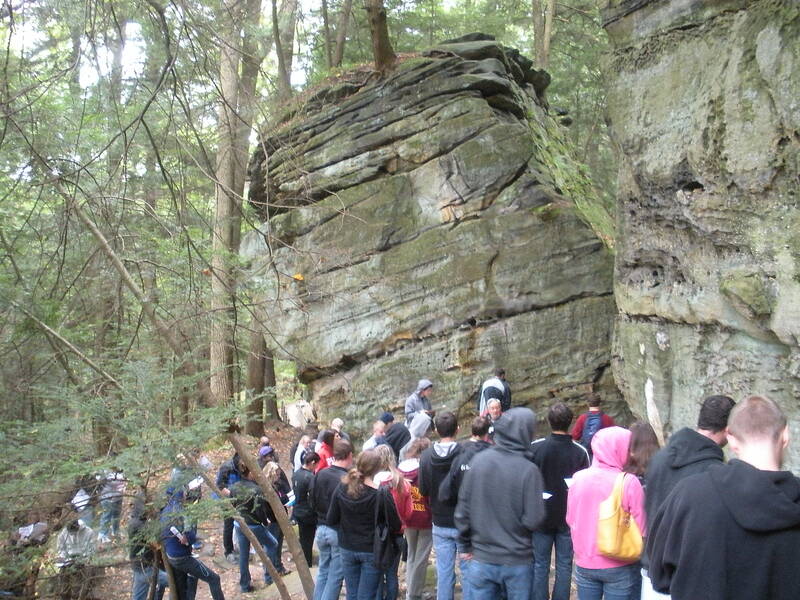 Students learn about the Sharon Sandstone during their Intro Geology field trip. But the students aren’t here solely to see what is missing. The park is full of geological lessons: sedimentary structures (cross bedding and weathering patterns), different depositional environments (braided streams and sea floors), slope stability (debris flows, rock falls, and creep), river evolution, ground water and contaminants (the Sharon is a major aquifer in NE Ohio), glacial geomorphology, and many more. It’s always fun to lead these trips and see that look in the students’ faces when they finally get why geology is both fun and useful! The “missing time” is simply due to the unconformity (erosional surface). The top of the shale was eroded away – or deposition did not occur or both – before the sediment making up the sandstone was deposited on top. The period of erosion/non-deposition works out to about 24 my.